The Saint Bernard is one of the most recognizable of all dog breeds. Traditionally they were rescue dogs in mountainous passes, however today most are kept purely as companions. 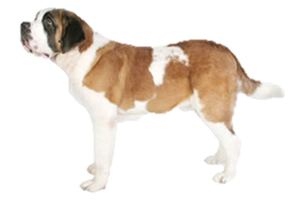 The Saint Bernard is the National Dog of Switzerland and was developed in the Swiss Alps. Today they are one of the heaviest dogs in the world, but the older working forms were smaller. Their history begins in the 10th century, when a monk named Bernard de Menthon established a hospice in the Alps to help travelers cross the dangerous passes, although it is unknown when dogs were first brought there. These early dogs were mastiffs from nearby valleys, decedents of the Roman Mollosian war dogs who may share ancestry with the Tibetan Mastiff and related to today’s Sennenhunds (Greater Swiss, Bernese, Appenzeller and Entlebucher). These dogs were not rescue animals, but property and guard dogs. The monks used them for the same tasks and they gradually became known as the Alpine Mastiff. They began experimenting with breeding, using various dogs to improve their mastiffs, such as Great Danes and Bloodhounds. However, it was not until 1774 that they were first recorded for rescue work. Edward Landseer would later add their legendary brandy cask to their image, even though the dogs never carried one. The most famous dog, Barry, lived from 1800-1812 and saved at least 40 lives, some have suggested that number is closer to 100. Today his body still resides at the Museum of Natural History in Bern. In 1830, after several losses during extreme winters, there was a desire for thicker coats so Newfoundland (and possibly Great Pyrenees) was added to the gene pool. Some disliked the longer fur, they argued that the fur iced and dragged the dogs down, but others viewed it as added protection. Both varieties had adamant supporters and as a result neither type was ever bred out of the line and continues to exist to this day. Is the Saint Bernard Right for You?